Looking for an academic cap and tassel? Mortarboard or PhD tam? We stock black velvet 4-sided -- 6-sided -- and 8 sided master's and doctoral tams with your choice of silky tassel or gold bullion metallic graduation tassel. Or we can make you a PhD tam using PhD blue velvet to match the velvet on our deluxe PhD gowns and hoods. 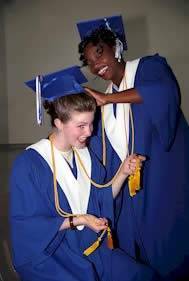 We also stock mortarboards in your choice of white, gold, royal blue, light blue, gray, purple, black, navy and maroon/burgundy. Select your style and color, and the quantity you want to order. Honor chords and stoles are also available. 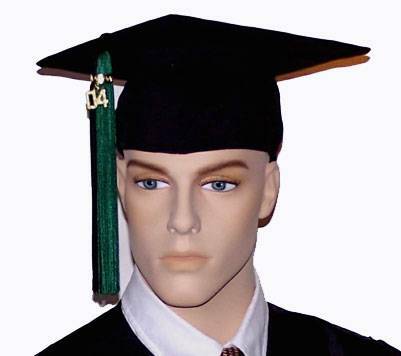 Academic Cap ~ Mortarboard Shown above with JUMBO tassel. Regular Tassel (Single or Two Tone) is available with year date charm (i.e. 2005) at No Charge. Or without Year Date. Your choice. Jumbo Tassels: Special Make -- Please allow 4-6 weeks. $6.75 each. Available in single or two tone - with or without year dates. Minimum order 144 (12 dozen). This is the most round looking tam, and is the best looking on large individuals of physical prowess. Most average sized women and short to average size men tend to look best in the six sided model. The six sided tam is the most popular style, since it looks the best on most people. Most short & stocky women tend to look best in the four sided tams, since it looks the least round. Remember your honor accessories. 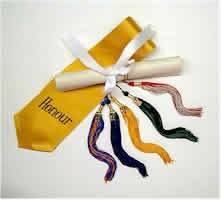 Honor stoles and honor chords are available in gold.